Growing up in a dystopian world under the control of a drug lord, Matteo Alacran, also know as Matt, must face many trials to secure not only his freedom, but his life. The House of the Scorpion, by Nancy Farmer, is a dark and twisted but ultimately hopeful story of a young boy who finds out he was not in fact, born, but harvested. This story includes a host of vastly different characters among which are Matt’s adopted mother, his bodyguard, the drug lord El Patron, and Matt’s nemesis, Tom. Matt’s adopted mother, Celia, a servant at El Patron’s mansion, was the only person he had ever known until the age of seven, when he met his first real friend and everything changed. Being a clone, or a copy of another person means that Matt is technically livestock and is treated as such. Even the affection and immunity the utterly cold and ruthless El Patron provides his clone with cannot change this. The drug lord assigns a bodyguard named Tam Lin to protect the young clone and he becomes a friend and mentor to the curious boy. Tom MacGregor, who receives a sadistical pleasure from tormenting Matt, is the bane of the clone’s existence until bigger problems are presented to the teenage protagonist. Themes of apprehension and anxiety along with those of worry and mystery were evident throughout the book. Nancy Farmer’s descriptive and slightly melodramatic style really helps readers to visualize every aspect of every scene in great detail. Even though at times the long descriptions could become tedious, they greatly enhance how readers are able to understand and interpret the scenes. This book, written in the third person, is divided into five sections, with the first four being based on Matt’s age, and the last one being based on a significant event in his life. 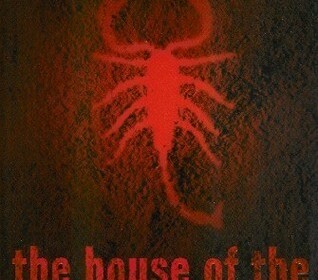 I found The House of the Scorpion impossible to put down with its fast pace and suspenseful cliffhangers. Each time I picked it up I would fall seamlessly back into where I had left off. I would recommend this book to anyone over twelve who enjoys a darker dystopian or science fiction novel.